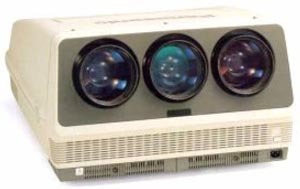 The Panasonic 1085/1083 projectors are 7" (actually 8") electrostatic-focus projectors with colour filtered HD-145 lenses like in NEC PG's for sharp focus and excellent colours. A bright 850 lumens of light output and a maximum scanrate of 100Khz. These projectors are fairly rare in the used market but should be considered as they are very capable for home theater use. To see how these projectors ranks in relation to other projectors for use in a home theater environment see the Projector Rankings page. For an overview and history of Panasonic see the CRT Primer.